The Cornerstone Corporate Center, is conveniently situated in San Diego County (north) near Palomar Airport. This suite is convenient and easy access to the 5 and 78 Freeways, and is a quick 30 minute car ride from the San Diego Airport or downtown areas. This court reporting conference suite is eye-popping for its professional and beautiful environment. 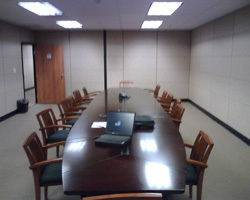 Features include: a beautifully appointed reception area, meeting and deposition rooms accommodating up to 40, videoconferencing and a friendly, highly-trained staff to provide support on an as-needed basis.